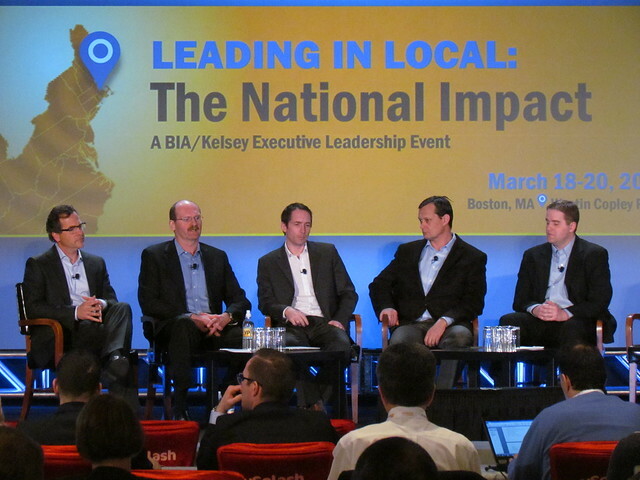 Today at BIA/Kelsey’s Leading in Local Conference, we kicked things off with an analyst roundtable. The theme: mobile is siphoning off usage from the desktop and other media. That comes in the form of search query volume, minutes spent, etc. So “what does that mean for advertisers?” posed moderator and BIA/Kelsey Chief Strategy Officer Matt Booth. More importantly for this audience, what does it mean for the publishers and media companies competing for their ad budgets? Google for one is losing search volume from the mobile time spent (4 out of 5 minutes) on apps. People don’t search Google within apps as much as they do on the mobile web. At the same time mobile CPCs are lower than desktop. Google’s Enhanced Campaigns should accelerate the adoption of mobile advertising — especially among SMBs — by forcing it upon anyone buying paid search. Mobile CPCs will go up through higher bid pressure, and unified/desktop/tablet campaigns. Video monetization is meanwhile being fueled by the massive uptick in video views and video content. For the latter, YouTube and other have evolved into a source of quality and long form content. It’s no longer just cat videos says Ducey. The growth of this content should increase monetizabile inventory and lower CPMs he added. This should make it a more attractive ad buy, in addition to the ways online video is increasingly showing high engagement and branding opportunities. In the print world, Charles Laughlin translated the mobile usage shift into the sales strategy for directory publishers. The amount of media SMBs are now buying has increased per advertiser as a corollary to broadening user touch points. This makes publishers’ product bundles broader and more complex, which is always a barrier to SMB advertiser adoption. Some publishers (Eniro in Sweeden ) have responded by splitting up their sales channels between traditional and digital products. Jed Williams capped off the discussion with a look at what Facebook is doing to capture all of this broadening user activity. This was most recently seen in its Graph Search announcement which will capture long tail searches. That will come about in mobile where intent is different — local graph search for example will be an interesting discovery engine that infuses social relevance to local search. The ad/commercial implications follow. Lastly, Facebook’s Atlas acquisition indicates a clear interest to build ad networks outside its walled garden (the broader web). This will be huge as signed in users will be served retargeted ads across the web, based on their Facebook activity. It’s basically what they’re doing now with cookie-driven retargeting within Facebook… but in reverse, unleashed out to the broader web. Huge.